← A Deep Dive Into the Internet of Things – ICD Brief 62. Smart phones, smart cars, smart cities: The Internet of Things has changed the working landscape of most places on earth in a short time. However, in this transformative decade we have learned that every innovation provides an equal level of re-engineered threat. From heart pacemakers to energy utilities to submarines to nuclear reactors – the list goes on. How do we protect these devices? Are there industry, international standards for security? Who is responsible? Who is accountable? In this week’s deep dive, we ask four area experts to give us their views on how best to “grow” the IoT while ensuring its protection. We interviewed Ahmed Banafa, Engineering Professor at San Jose State University; Brian Russell, Chief Engineer Security Solutions, Leidos; Captain (Dr) Simon Reay Atkinson, University of Sydney and Royal Australian Navy Reserve and William Dutton, Professor of Media and Information Policy at the Ouello Center, Michigan State University, in order to grasp the complexity of the issue. Captain Reay Atkinson noted that “there is still an emphasis on control and EW as opposed to socio-IT, socio-ethics and capacity. The question is not our capability or the ability of individual thinkers. It is about capacity and bringing IoT effects to bear over the network within the nexus defined between cyber and big data; and privacy and security.” Although in cybersecurity circles, one usually hears about the problems associated with IoT one cannot ignore the immense possibility which lies within it. Professor Dutton called it “the next stage of the Internet’s development” and emphasized that the IoT will “connect devices that can operate in systems with the aid of intelligent agents and Artificial Intelligence (AI), and people.” Similarly, Brian Russell emphasized that “the IoT generates massive amounts of data. That data provides insight into a range of business areas: ways to optimize manufacturing processes; better understanding of customer behaviors and desires; etc – in the end, businesses are aiming for a competitive advantage. Individuals are influenced by the capabilities offered by the IoT – for example, conveniences in the home through connectivity and automation. Governments are influenced by data as well- and they use IoT-generated data to better manage spending and better serve their constituents.” However, the full scale of changes which it will cause we cannot possibly foresee yet. This stands for the negative aspects as well. 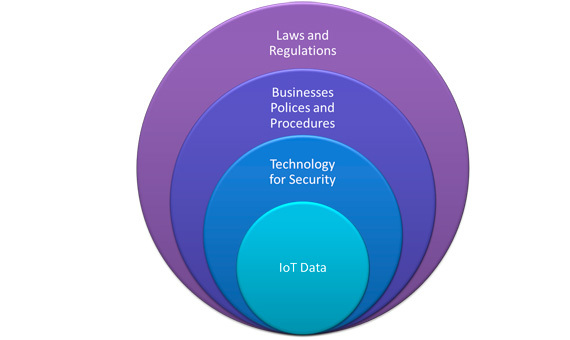 In one of his articles, Professor Banafa highlighted five distinct challenges which IoT faces: security; privacy issues; inter-operability standard issues; legal, regulatory and rights issues; emerging economy and development issues. As we can see, only one of these challenges is purely technical. Similarly, Professor Dutton also highlighted privacy as a primary concern, adding that the risk of system failures is also increasing. “Systems failures worry me because the IoT will permit us to build ever more highly coupled systems, which will likely be more fragile as problems in one component will ricochet through the network in ways to create more and more severe system failures” he explains. He also added that in the case of IoT, the context in which it is employed is crucial to understand the specific challenges. “For example, consider the social implications of the IoT in an environmental application, such as monitoring pollution in a river in real time, versus in a medical care situation, monitoring a person’s heart” These examples demonstrate that each of these will have to be tackled in a different manner. As a result of its multifaceted usage, concerns about IoT will not be able to be tackled with one brilliant leap. The International Cybersecurity Dialogue was created to promote a better working relationship between the policy and technology communities in government, business and academe. Our weekly ICD Brief and these deep dives are part of this program. If you are interested in our previous articles, read it here and subscribe to our weekly cybersecurity brief here. This entry was posted in Interviews & articles. Bookmark the permalink.